The Fashion Film is the hottest new marketing genre pioneered by fashion icons such as Carl Lagerfeld, Bruce Webber and David Simms. It is fast gaining traction with top fashion houses, brand and sponsors as a way of exposing their brand and new ranges to a global audience while encouraging the viewer to engage with the DNA behind the fashion label. Founder of Africa’s Bokeh Fashion Film Festival, Adrian Lazarus has made his initial dream a reality. His first festival which was held in Cape Town last year proved to be a resounding success resulting in international acclaim and a massive submission of new entrants eager to gain access to this dynamic showcasing platform. The audience connects with the film on an emotional level, giving personal relevance to the brand and deepening the level of engagement, and it is for this reason that Mercedes-Benz has again aligned itself with the event. “Mercedes-Benz lays great importance on the support of local and international fashion platforms and the promotion of young designers. We support various initiatives in the fashion world and we are always looking forward to seeing the latest collections from all the exciting young and established designers showing at our Fashion Weeks. As our involvement with fashion is a central component of our lifestyle marketing activities, the Mercedes-Benz brand partnership with the Bokeh Fashion Film Festival plays an important role in highlighting our presence in the world of fashion and film. Fashion and automobiles are actually quite closely linked and design and image are pivotal to the success of both automobile and fashion brands. Our customers are highly fashionable and their automobiles are an extension of their lifestyle,” says Selvin Govender, Marketing Director, Mercedes-Benz Cars. As the creative hub of sub Saharan Africa, Cape Town is the perfect city to host Africa's Mercedes-Benz Bokeh Fashion Film Festival. The city is already a top destination for fashion shoots and a prime location for international film crews with a wealth of local talent in both the fashion and film industries. This event provides the opportunity to align these two thriving industries in the city. An international panel of experts from both the fashion and film industries will judge the submissions; these judges comprise film directors, fashion magazine editors, designers, stylists, fashion bloggers, brand managers and art directors. They will each bring a wealth of knowledge and expertise from their respective fields, ensuring all the stringent criteria are met in the judging process. The winning films in each category will then be showcased over the two Red Carpet ”Oscar Style” screenings on 27th and 28th March. A pop-up retail space, this year offers the fashionistas the opportunity to purchase garments as well as meet the local and International designers personally. “Fashions films create a narrative that captures the ethos of the brands identity.” Bryan Ramkilawan: CEO Cape Town Fashion Council (CTFC). The CTFC Designer Pop-Up, which will be located in the library of the 15 on Orange Hotel, will be open from 12h00 – 17h00 and 18h00 – 20h00 on both the 27th and 28th of March. Hisense Brand Manager: Ryan Curling. Other prestigious, high-end sponsors include global fashion news leaders – Fashion-One TV, MAC cosmetics, GHD Hair Care, Sunglass Hut and premium drinks brand - RGBC. Craig Dore’ Marketing Director RGBC comments, ”There is good synergy and alignment between the progressive art of Bokeh films and our really great brand portfolio of premium and deluxe spirits. 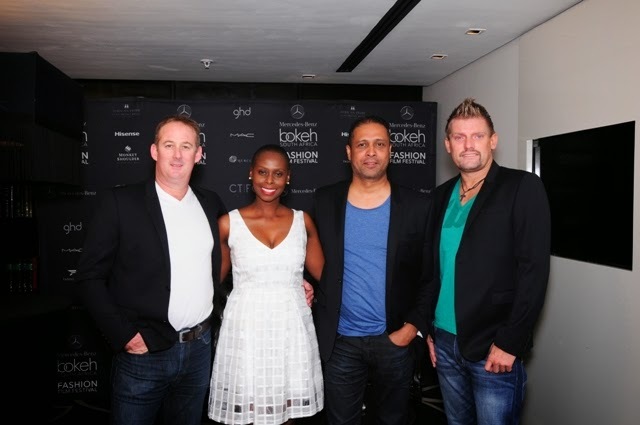 We strive to be innovative with our marketing to ensure our brands remain relevant with consumers but we also need to engage them in non-traditional marketing channels, like at Mercedes-Benz Bokeh Fashion Film Festival”. Mercedes-Benz Star Award - Mercedes Benz, will be hosting their own special category, with details being announced on our website in the upcoming days. The winner of this category receives a cash award of US$10 000-00 from Mercedes-Benz. Selected VIP guests and celebrities have been dressed by Jenni Button and Hilton Weiner of The Platinum Group for the red carpet event. Looking forward to the event whenever it happens in Johannesburg as launch event happened in Cape Town and I was not a part of the same.